Pini Kay wood briquettes have a low moisture content, this creates little deposits in the chimney. They are ideal for use in closed stoves, fireplaces and fire pits. A Pini Kay wood briquette burns on average longer than regular firewood and also gives off more heat. 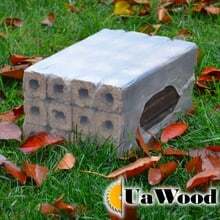 A pack Pini Kay wood briquettes weighs 10 kilograms and contains 12 Pini Kay wood briquettes. Pini Kay wood briquettes should be stored dry. - 100% clean wood with no additives!